How many times have you been followed by a white K bike and thought ... I'm in trouble now. 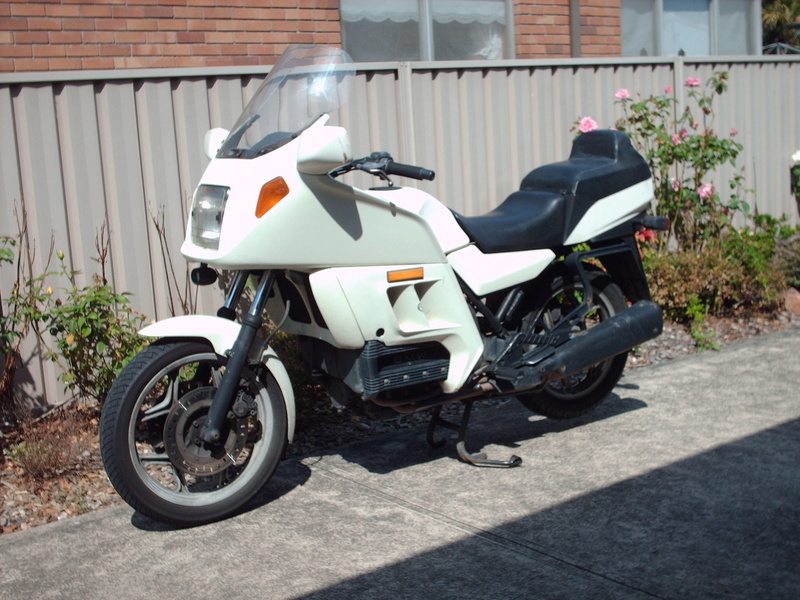 In 2003, my father in law gave me the opportunity to experience my first K bike , an ex- Police 1987 K100RT. Coming up from an 83 GSX 250 to a K100 was a blast to say the least . Of course riding the ex-Police K bike brought its own inherent issues . As it was my daily ride to work , and clothed in my pale blue work shirt . Drivers would continually ease up on their speed as I approached from behind . At times this was most disturbing , especially when I needed to get somewhere quick . As I have now progressed onto other K bikes , the what to do with my RT is in question . Shed space is at a blowout .So my thoughts of storage have extended to a local motorcycle museum . The museum in question holds a vast range of motorcycles , 900+. With the majority of exhibits being donated , and in as used condition . This is not a "concorse" museum . The bike once tidied up and ready to move will resemble in some modest way a K100RT Police bike , at least at first glance . With the addition of an interactive " Push n Play" interface panel , to display the lights and possibly a volume controlled siren , riders as a whole can continue to share their K "Police" experiences . Thanks to Seanii , and his recent donation I was fortunate to receive an original screen and some additional fairing bits which will help greatly. Lastly , the "POLICE " labels . It sounds like Klompy may be able to help me out with the crash bars , I'll be popping out his way in a couple of weeks time . Following an excellent Koffee break with the Krew at Robertson , I headed back into central Sydney to catch up with Alex McCarthy. Alex of course is one of our resident forum spec experts regarding Police bikes. Half a day well spent scrutinising bits and pieces . Thanks Alex , I enjoyed the visit . The original rear radio / top box is still in place , also a spare in the shed . I've got a rear blue strobe light Ed. I did have the pole it was on but its gone now. I'll leave it with Tom next time I'm up that way. The biggest worry about this reno , will be when it comes to transporting it up the highway . We'll constantly be looking in the rear vision at a police bike following us . In the UK, as long as the lights are covered and the POLICE wording has a bit of tape stuck though it, you're legal. In Oz...?